The Cony Rams collected 92 points to edge runners-up Maranacook, 85.5. Entering the final race of the day with 84 points, the Rams just had to beat Maranacook, sitting on 83.5 points, to claim the title. With Cony already known to have scored well in the 200, 330MH, 400, and 800, the 4 X 400 seemed ready made for the Rams. All that remained was to hold onto the baton and pass it safely. Cony pulled it off taking second in the 4 x 400 behind a speedy Belfast team and with a comfortable ten-second margin over Maranacook in sixth place. 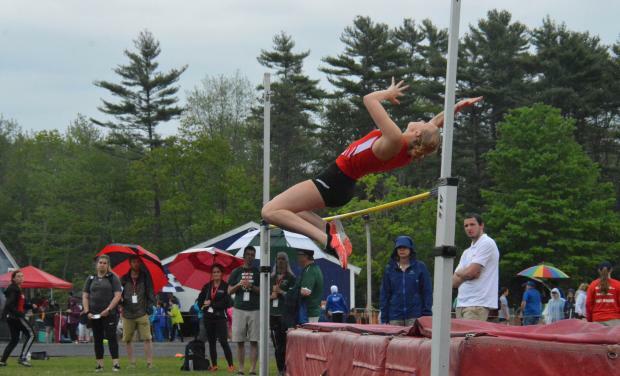 Cony got individual first place finishes from Tess Towle in the high jump (5-0), and Gabby Low in the javelin. 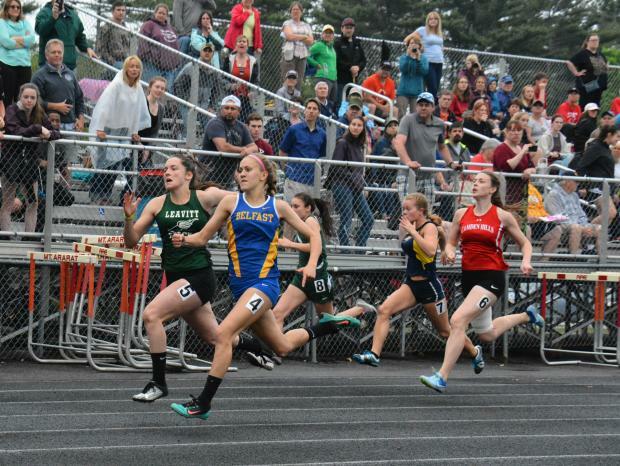 Each of them also scored for the Rams in other events as Towle took sixth in the triple jump, and took a leg of the 4 x 400, while Low took seventh, the final scoring spot in the shot put. Low's javelin throw of 116-11 was nearly ten feet beyond her previous best. 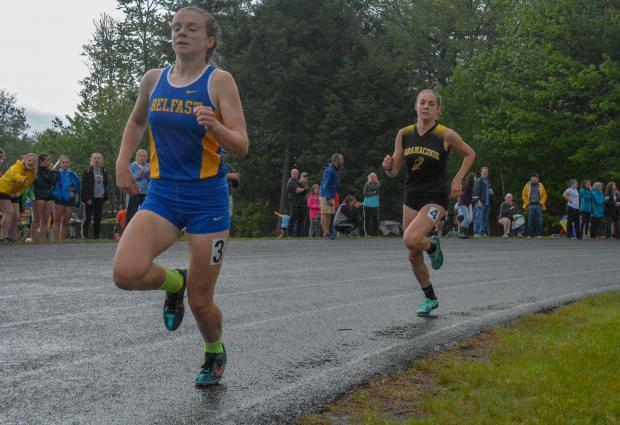 She'll head into the state meet with the longest mark of the year in Class B.
Cony also got solid points from the Reny sisters as each scored in three individual events as well as the 4 x 400. Anna Reny took second in both the 100 and 300 (47.25, a new PR) meter hurdles to go with a third place finish in the 200. Julia Reny took second in the 400 (1:01.54, a new PR), third in the javelin, and fifth in the 800 (2:30.62, a new PR)) to go along with the anchor leg of the 4 x 400 team. 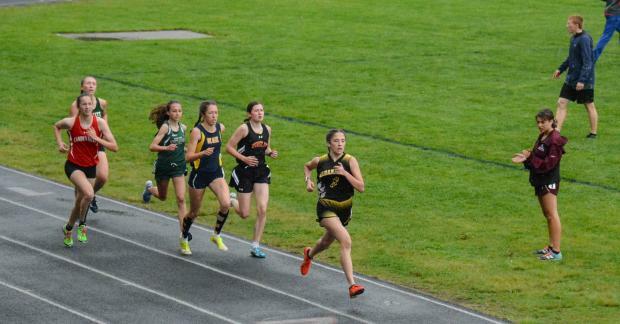 Other scorers included Annemarie Towle who claimed second in the race walk, Tessa Jorgensen with a fifth place finish in the 3200 and Cecilia Guadalupi who took the final spot in the 1600. The Rams also took second in the 4 x 800 to go with a sixth place finish in the 4 x 100. Second place Maranacook (85.50) spread the scoring a little more evenly as eleven Black Bears notched points. Nicole D'Angelo led the scoring by taking first on the pole vault with a new personal mark of 9-09, she paired this with a third place heave in the shot put. Janika Pakulski scored in three events: a third in the 100 (13.15), fifth in the 200 (27.25), and she joined D'Angelo on the podium for the pole vault after finishing fourth. Both the 100 and 200 represented new fastest times for Pakulski. Molly McGrail placed second in the 800 and fourth the 200. McGrail's second place time in the 800 at 2:24.50 highlighted a developing distinction between Class A and Class B in the KVAC. With the move of Cony and Mt. Blue "down" to Class B this season there are now eighteen teams in Class B and just seven in Class A. As a result the races in Class B are packed with qualifiers, lanes are rarely left open, and the races can be extremely competitive. The 800 is a perfect example. With the five top seeds-Tahlia Mullen (Lincoln), Kaylee Porter (Erskine), Emily Jolliffe (Belfast), McGrail, and Miranda Dunton (Camden)-all having clocked sub 2:30, and with Cony's Julia Reny just on the cusp the smart money, in what was plainly going to be a competitive race, would have been on Porter and Mullen to go to the wire with Belfast's Emily Jolliffe holding down the third position. Jolliffe has been remarkably consistent, opening the season at 2:27 and running off consecutive 2:26s through the remainder of the season, but McGrail was a wild card as she had only broken 2:30 once, and that just last week at the Capital City Classic where she ran 2:28.49. At 250 meters Porter lead Mullen and a pack of four that included Camden's Rose O'Brien and Miranda Dunton on the inside with McGrail and teammate Sophie O'Clair just outside. This pack forced Belfasts's Jolliffe to use parts of the third lane on the curve to recover her position toward the end of the first lap. By 500 yards the lead groups had resolved into two pairs with Porter leading Mullen and Jolliffe settled in third with McGrail off her shoulder. Mullen grabbed the lead down the back stretch and looked prepared to stretch it out but Kaylee Porter regained momentum and used the final curve to re-take the lead. Porter put it away in the home stretch on the way to a 2:23.07 finish. McGrail screamed through the last 150 meters to overtake a spent Mullen just at the finish line and notched a new personal best at 2:24.50. 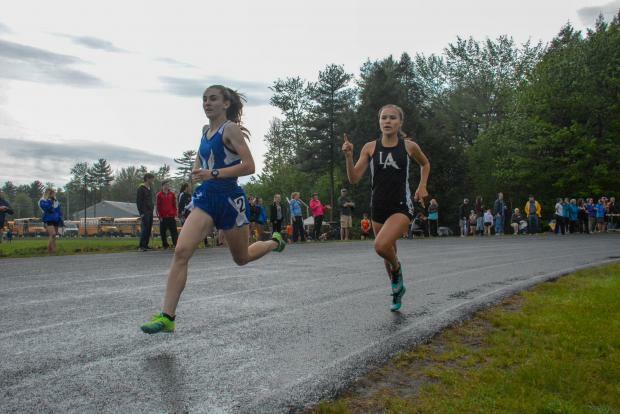 Maranacook got additional scoring as O'Clair, who finished out of the money in the 800, nabbed the fifth spot in the 1600. 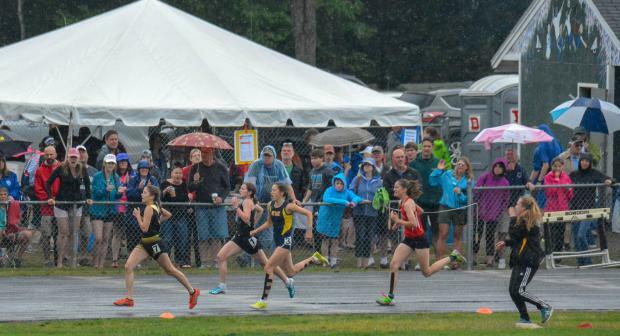 The Black Bears strong harriers showed up as Maddie Taylor and Laura Parent went two-three in the 3200. Ashley Cray took 5th in the high jump while Grace Despres took the same spot in the triple. Gabrielle Green was fourth in the javelin while Ariana Wiles took third in the race-walk. Winslow and Belfast had strong meets with 78 and 76.50 points respectively. In addition to Jolliffe's performance in the 800, the Lions dominated the shorter distances with Junne Robertson-McIntire taking the top spots in both the 100 (12.71), and 200 (26.14) while Kelsey Mehuren won the 400 at 1:01.24. The Lions also claimed the tops spots in all three relays as Zoe Deans, McKenzie Banks, Hannah Sanderson, and jumper Lillie Mitchell rounded out the relay teams. Mitchell also placed in the long, triple, and pole vault while Shera Hilt scored in the javelin and discus to close the scoring for Belfast. Winslow had strong performances from Olivia Tiner and Maeghan Bernard as each took a pair of titles. Tiner won the 3200 and the 1600 while Bernard took both hurdles titles. Bernard's marks of 16.22 in the 100 MH and 46.91 in the 300MH each set new personal bests; she also put up points for Winslow by placing sixth in the high jump. Tiner's run in the 1600 again highlighted the growing divergence between Class A and B. Tiner finished in 5:30.45 to establish a new personal mark, but she had plenty of company as the top eight finished below the state meet automatic-qualifier of 5:40; by contrast just four made this mark in the Class A meet. In addition, at various times each of the top five finishers-Tiner, Kahryn Cullenberg from Mt. Blue, Camden's Miranda Dunton, Sage Pound of Mt. View and Maranacook's Sophie O'Clair took shots at the lead position. 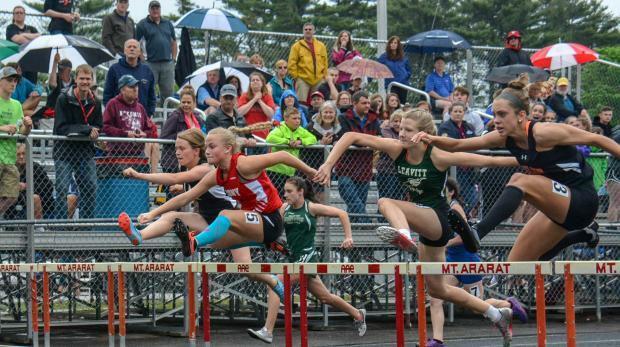 Sage Pound took the lead around 200 meters held onto until just short of the 800 meter mark when Tiner moved ahead. Mt. Blue's Cullenberg made steady progress from the pack during the third lap and looked strong moving to the third position with about 500 to go. At 300 meters Cullenberg moved for the lead only to see Sophie O'Clair whip up from pack to take the lead and begin stretch it on final back-stretch. Here Tiner dropped as far back as 4th, as Camden's Dunton gave chase to O'Clair and Cullenberg. But Tiner had something left and came out of the final curve in third, and accelerated in the last 100 to overtake Cullenberg and then O'Clair. Cullenberg followed for second place while Dunton took third; Pound made a big push at the end to just catch O'Clair for fourth place at the line. Payton Goodwin of Lawrence took the long jump title (15-09.50) was fourth in the triple and placed in the 400. Victoria Friend of MCI claimed the Triple title (32-03.25) and Mount Blue's Julia Hatch took the race-walk at 8:59.11, a new personal best. 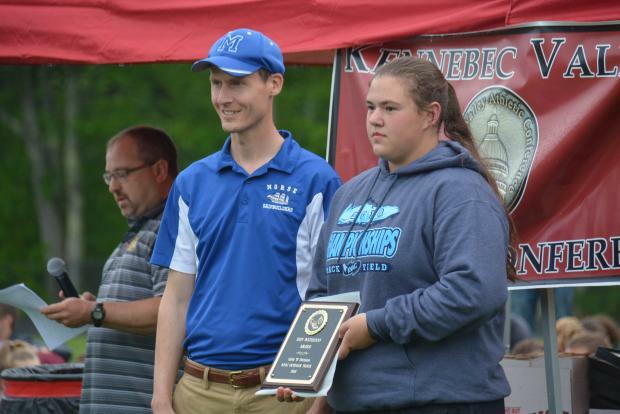 The winner of the Don Matheson Award as the top field performer of the KVAC Championship was Waterville's Sarah Cox who claimed top spots in both the shot put (37-11.25), and the discus (116-05). Cox successfully defended 2017 KVAC titles in both events; she is also the reigning State Champion in the shot put. The discus throw represents a new personal best for the junior as she looks forward to next weekend's State Championship meet.